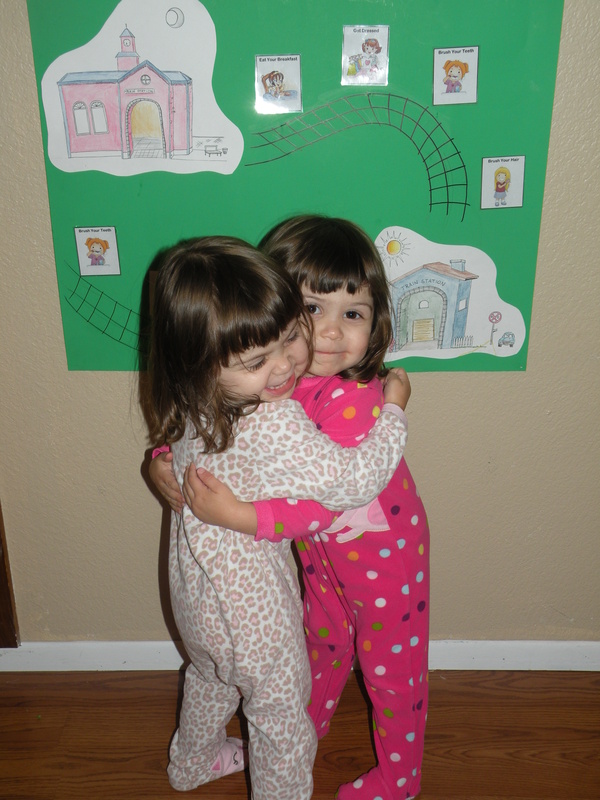 Sometimes it’s hard getting two very excited little girls ready in the morning and evening. 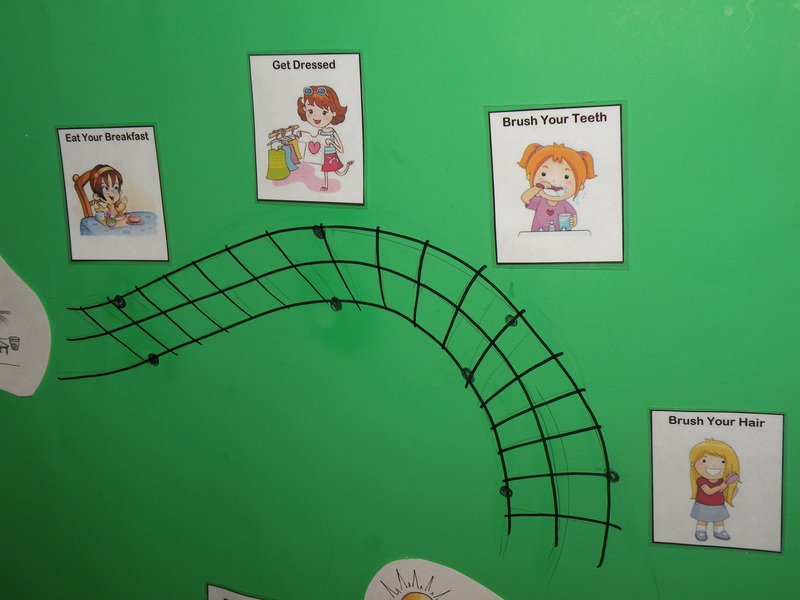 In an attempt to make things more efficient and encourage the girls to be more independent I wanted to set up some sort of chart system. I spent a lot of time looking online for one to buy (I’ll include a few of the ones I liked but passed on at the bottom in case you’re interested). But I couldn’t find one I liked. I wasn’t a big fan of the reward systems on the charts I saw, although some weren’t too bad. We just didn’t think the girls should be earning a reward for doing the normal daily things that are expected of them like brushing their teeth or picking up their toys. We also didn’t want the girls to get overly focused on the reward. After a lot of thinking, I realized that what I was really looking for was more of a routine chart than a chore chart. I didn’t want a list of chores but a routine for us to move through each morning and evening. 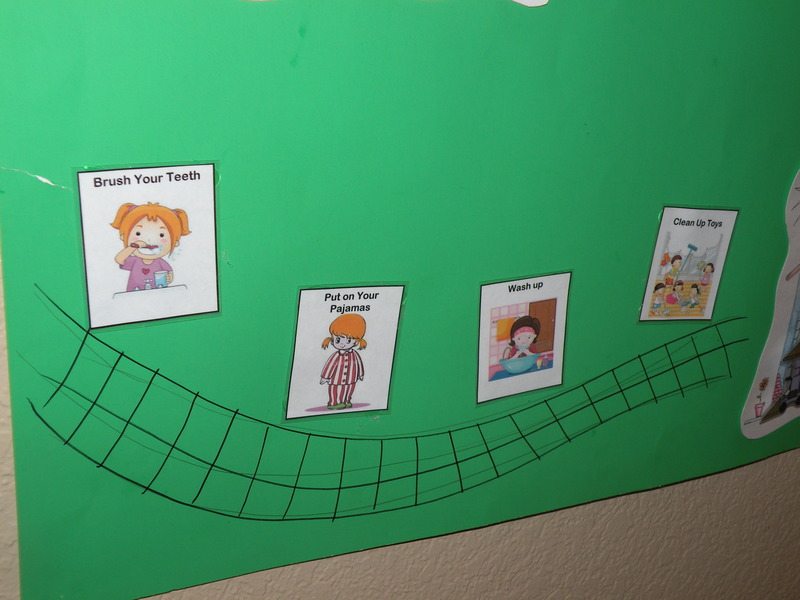 Recently I’ve been reading Positive Discipline for Preschoolers and in it they talked about a routine chart as opposed to a chore chart. Their suggestion was just a simple chart listing the routine, perhaps with pictures. That just seemed too boring for us with no way for little ones to keep track of what they had completed. So after a lot of thought, this is what we came up with. It’s a train that the girls move through their day. 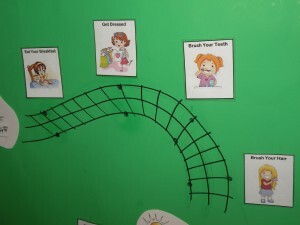 We chose four tasks that the girls need to complete in the morning to get ready for the day and four to get ready for bed. I made sure that they were tasks we do every day. In the morning I have: eat breakfast, get dressed, brush their teeth, and brush their hair. For the evening Mia and Zoe need to: clean up their toys, wash up, put on their pajamas, and brush their teeth. 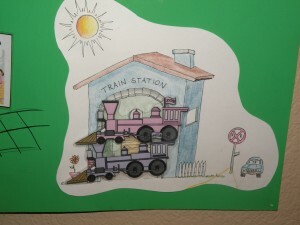 I used clipart to make the activities (my husband drew the train stations and made the trains). 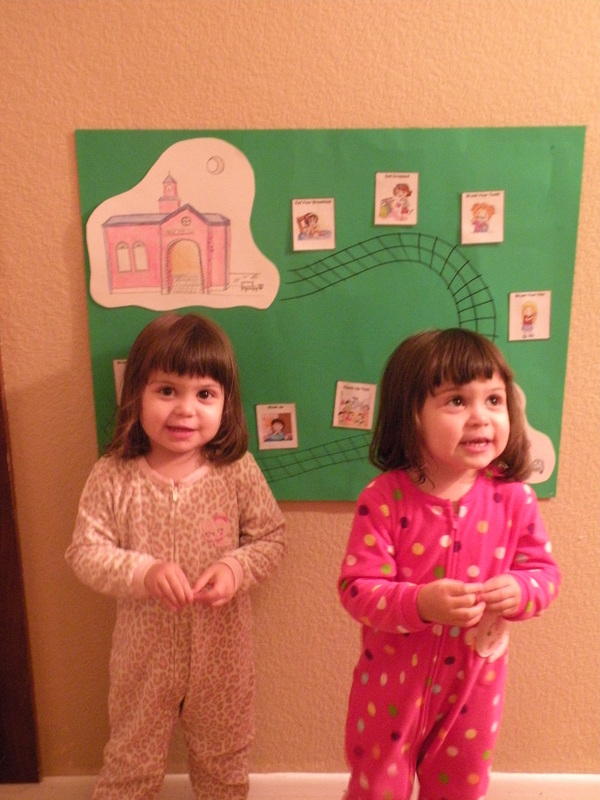 I wanted the girls to be able to identify the task by the picture, not just the words. 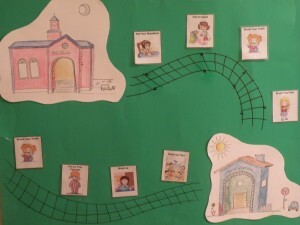 I wanted the chart to move as a circle so that they move one way in the morning and then back to the train house in the evening. 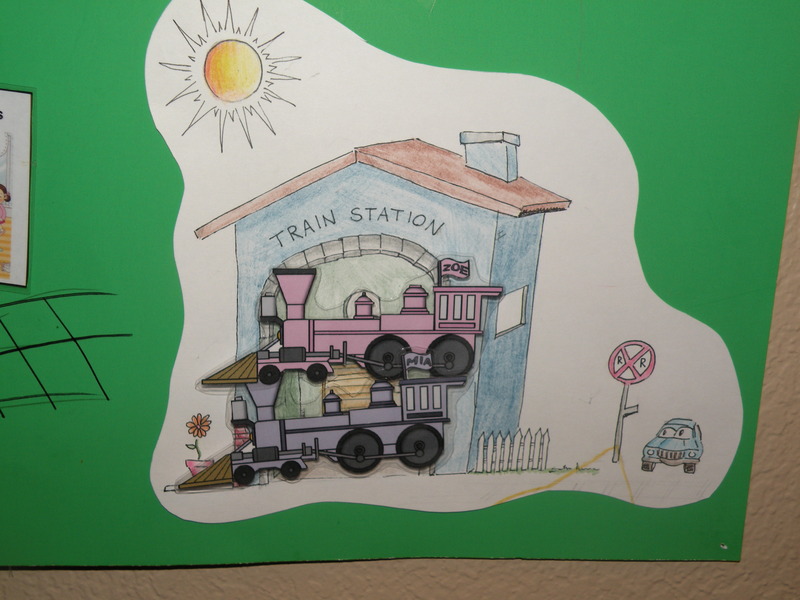 To do this, I then realized that the trains would need to turn around or they would be moving backwards. 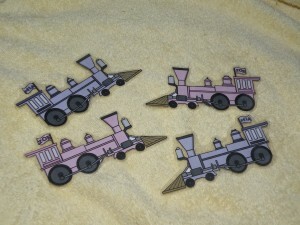 I found the easiest way to solve this was just to make two sets of trains that I change out when we use the chart. I added an envelope to the back to hold the extra trains. I thought a long time about how to move the pieces. I decided to make them magnetic. 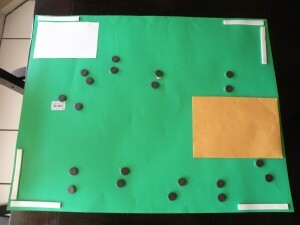 Originally I was thinking velcro but I’ve used it before with some file folder games and after a few times it tends to tear off of the paper with the girls pulling on the pieces repeatedly. I tried to use magnetic paper but it wasn’t strong enough to hold up the train piece through the piece of paper, especially when I laminated the pieces. 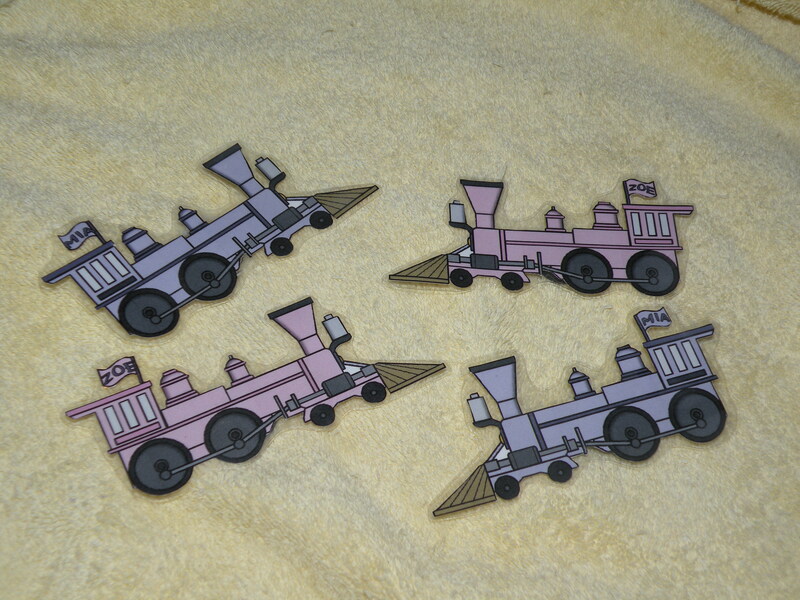 Instead, I just used the larger round magnets from Michaels, on the back of the train and for the different stops. To make it look prettier and to keep the girls from picking at the magnets, we glued the magnetic pieces to the back of the chart. We did need to add the dots on the track so that the girls could easily see where their trains go. Great! The girls really enjoy moving their train from spot to spot. It has made our mornings much more efficient and pleasant since I no longer need to nag the girls to finish getting ready. I just ask them to check their trains and then we see what we need to do next. Once all the tasks are completed, they either put on their shoes for us to go out or they get to play and then their trains move to the daytime station. One thing I really like about the chart is that it is also okay if we don’t use it one evening or morning. 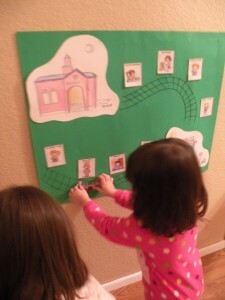 With the charts that gave a star for each task completed to earn a reward, I felt like we couldn’t miss a single morning/evening or the girls would be punished for moving along without the use of the routine chart or for having a fun evening out. But this way the reward is just the moving of the trains. Another thing I like is that I can put both girls on one chart. I’m embarrassed to admit that it took looking at charts online for awhile before it dawned on me that I would need two chore charts for the girls. Duh! This way I could fit both of them onto one chart. You could even fit three or maybe more depending on the size. One of the best pieces of advice I got when we were preparing for our twins was to keep track of their feedings and diaper changes. It sounded silly at the time but after I had the girls there were sleep-deprived days when I did not know which was up and could easily have fed the same baby over and over. 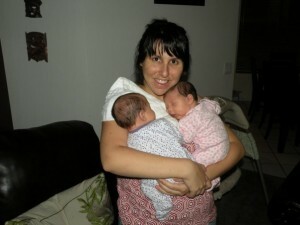 With newborn twins you are so tired and overworked that it is easy to get confused. Besides feeding the same baby twice, you could also miss one baby being constipated or having other problems. Also with multiples you probably have even more people helping out than you would with one baby. Your spouse, parents, friends, other family, may all be more involved. 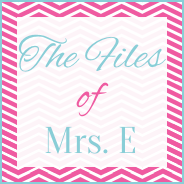 Charting feedings and changes can make it easy to pass off the kiddos. We started with charts they use at the hospital. The nurses gave us extras to take home until we could make our own. We saw some very complex ones online to keep track of every minute of the day, but, for our family, we found those unnecessary and were able to make up a simple one on the computer. We kept track of their feedings (time, amount, order fed) and their changings (urine or stool). I also wanted to keep track of tummy time because it is easy to overlook with two tiny babies and then included space to describe the day or special notes. To help you get started, here’s our chart: Twins Chart If it was a feeding we filled in the amount portion, if it was a diaper change we checked if it was urine or stool. Want to know the very best advice I got? Whenever one wakes up, wake up the other. And whenever one eats, feed the other. Everyone says don’t wake a sleeping baby, but not with twins. It gets them on the same schedule and makes your life easier. 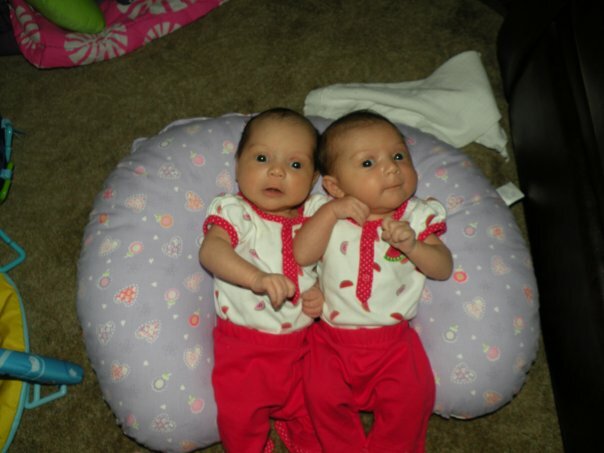 Want more tips and advice for twins? Check out Twins! 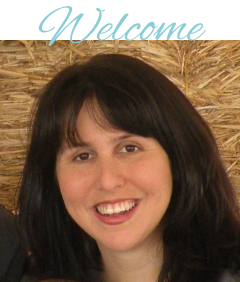 Expert Advice from two practicing physicians on pregnancy, birth and the first year of life.